First impressions If BlackBerry is to complete the greatest comeback since Lazarus, it all depends on how it can lure back former users as well as woo new customers. 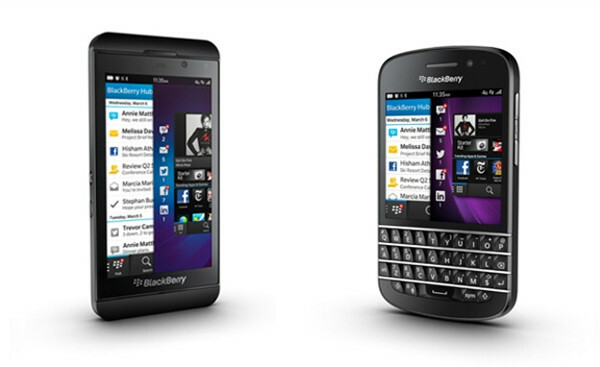 Which means its fate hinges on BlackBerry 10, its new operating system and apps platform. BB10 has three things going for it. It’s technically sophisticated and well up to the challenge of multitasking reliably while drawing very little power. It has a radical user interface that’s full of good ideas, and it also benefits from hindsight. There is an upside to leaving it very late: it’s called late-mover advantage, and this has allowed the-company-formerly-known-as-RIM to take note of features customers struggled to use on rival devices, and make sure its own OS is free of those difficulties. However, the implementation of BlackBerry's new design ideas may confuse some stalwarts and present newcomers with a bit of a learning curve. In practice, it's arguable whether the new Hub of incoming messages is more efficient than the Notifications pull-down tray found on Android and iOS - it certainly takes more work to glance at an incoming message. In addition, true 'Berry believers will find many features missing from this first release, from sound profiles to nightstand mode to custom LED alerts. And the biggest omission of all is like a submarine that hasn't surfaced yet: one of the key characteristics that "made" a BlackBerry - the BIS servers giving consumers end-to-end encrypted push email - aren't supported in the new platform. BlackBerry Internet Service (BIS), not to be confused with business-friendly BlackBerry Enterprise Server (BES), is now largely used to power the BlackBerry Messenger (BBM) network. What this means is that for many existing users (in the prepay market, mostly) the email experience will be similar to that of a stock Droid device. This raises the question, "is it still a BlackBerry?" - and it's such a big question, we'll tackle that in a separate piece rather than in this overview. Last year, some folks at RIM walked me through the new system and I came away very impressed. The idea of applications as “cards” was implemented in the now deceased webOS, and BB10 is conceptually similar. Some Samsung devices have a split-screen view, allowing you to see (part of) two apps at once. What’s original in BB10 is that the message list is permanently “under” the cards. 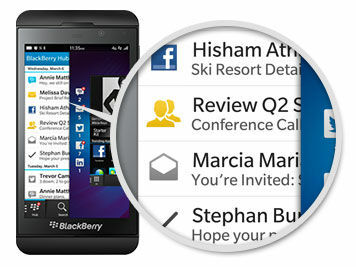 The BB10 Hub is like a carpet underneath all the other applications, which can be shunted aside with a gesture. That’s the idea, anyway. Much of what’s on show here is very impressive. The single most discombobulating thing about the BB10 design is the discovery that there is No Place Like Home. There’s no Home button to take you back to a familiar display and therefore no fixed point of reference. Yes, the help screen refers to a Home screen (which I’ll come to) - but this is really a task-switcher. It's nicely accessible through a single finger gesture, but it is limited to just the eight most recently used apps. Confusingly, RIM also refers to the adjacent application “launcher” grid as Home, but finding this requires another swipe of the touchscreen. Underneath, of course, is the Hub of messages. Certainly this arrangement succeeds in allowing you to peek at the message list quickly from any application - one of the BB10 design goals is allowing the user to "flow" in and out of messaging without making a great contextual leap. On that count, it works. If this sounds straightforward, then collect £200 as you pass Go. You won’t have any problems. But if you unconsciously take your bearings from a home screen, or root your activities with a fixed reference point, you may struggle a bit. As I did. In practice I found I was spending a lot more time moving things out of the way than I expected. This meant getting things done was taking longer, too. With almost all rival devices you can see an incoming message with one click. Yet in BB10, you have to perform a two-stroke gesture, which brings you to the Hub. But you still can't see the message. There may already be an open message which needs to be moved out of the way from the last time you used the Hub. Then you have to smack the collated view at the top of the Hub accounts list (which can't be sorted). This is easy enough for RIM BlackBerry to fix - the Hub can be assigned its own unique gesture to access. But why didn't anyone realise what a cumbersome process this is? I’m inclined to forgive designers who try new things. Apple’s original iPhone design was perfectly justifiable at the time but now looks very Fisher-Price. Even with the addition of task switching and notifications, the application silos are quite cumbersome. BB10 is an attempt to unify three things: a launcher, a switcher and a messaging hub, and there are only so many ways to crack that nut. There will be a learning curve for some users, then, as they adjust to the new metaphor. It’s part of the package. So what’s the Z10 like to use in practice? Here’s some first impressions from my experience. The company has wisely not concentrated on gimmicks at the expense of its core strengths. RIM began life making two-way pagers, and despite losing half of its income it knows why people still choose BlackBerry: it excelled at messaging and thus it must continue to do so. I was surprised, though, to find that the new system doesn’t pick up one's email although BlackBerry Enterprise users shouldn’t have any trouble. On every BlackBerry I’ve ever used, once you punch in your BlackBerry ID, you only need to confirm the passwords for your internet mail accounts, and you’re up and running. Tech support confirmed to me that BB10 doesn’t do this. I had to manually configure the server settings and login details for each email account. I then encountered some inexplicable problems setting up IMAP access, but these were eventually resolved. Setting up a GMail Calendar needs to be done through the Exchange setup route, not the IMAP route, or you will only see emails. Windows Phone currently grabs the calendar using either configuration route. Nothing about BB10's email setup is remotely pleasant, with the device taking more than 45 seconds to verify each account - long enough for the screen to fall asleep and go black.